Spastic Diplegia is the most common form of cerebral palsy in children who have been born early. Every once in awhile, a child is born at term and develops typical, preterm pattern diplegia. This usually means that the child’s brain ran into some difficulty in the uterus prior to birth. Overall, diplegia comprises 38 to 40% of all the children with cerebral palsy. The most common cause is bilateral periventricular leukomalacia (PVL) affecting a specific area of the white matter of the brain. The area most at risk is the site of the descending corticospinal tracts carrying messages from the motor strip of the cortex to the body. As you can see in the diagram, the hatched PVL area first affects the fibers coming from the feet and legs. Early in development, this area is a boundary zone between developing arteries that are growing in from the surface of the brain and others that are growing out from the center of the brain. Boundary zones are particularly vulnerable to changes in the blood flow that are common in sick premature babies. 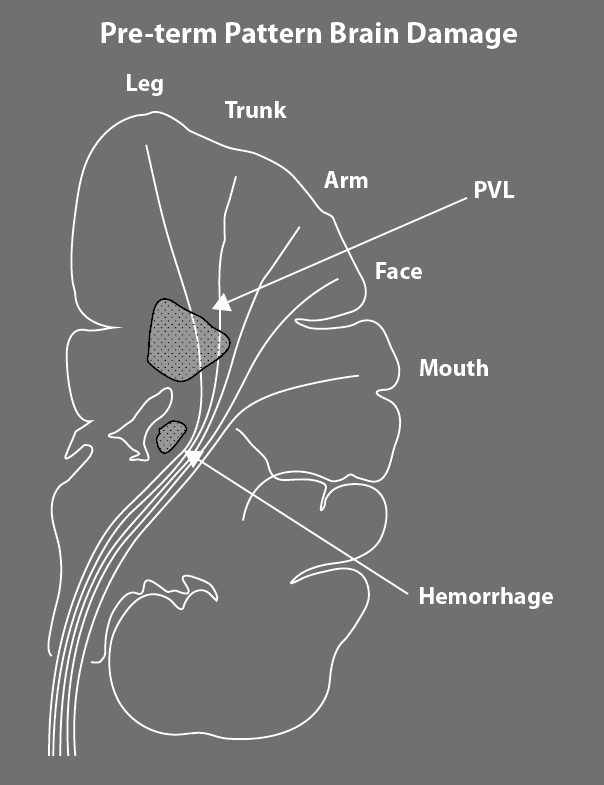 Germinal matrix hemorrhage, the common precursor to intraventricular bleeding is also diagrammed. Bleeds from the germinal matrix that extend laterally into the brain also pick off the feet first, but you can see that the corticospinal tracts are much more closely bunched together in this area. This means that even a relatively small hemorrhage may extend enough to cause hemiplegia. But, as I discussed last week, preterm pattern hemiplegia and preterm diplegia both present with an ascending pattern of severity with the most severe involvement around the feet and ankles moving up to the hip. Over my long career, there have been major changes in the severity of cerebral palsy seen in NICU survivors. Some major problems, like post-kernicterus brainstem damage, are now effectively prevented. Overall, there has been a major decrease in the severity of neurological problems, along with a decrease in associated issues related to being born prematurely. The survival rate is up and the disability rate is down. Yet, traditional thinking is that there is still “no hope” for a cure for cerebral palsy. This is a quote from a book published in 2012 by two noted cerebral palsy experts. I think this is strange! As far as I can figure out, every other pediatric disease or disorder accepts the goal of a cure, no matter how distant that goal may be. Think of Jerry Lewis and muscular dystrophy, brain tumors, autism… the list goes on and on. In terms of my quest for a cure for cerebral palsy, preterm pattern hemiplegia and diplegia are the very best candidates for a quick improvement in outcome. Brain injury in the very immature brain occurs in the areas of the brain that are rapidly growing. The last trimester of pregnancy and the first four years of life are periods of exuberant neuroplasticity and have a great potential for regrowth, repair, reorganization and reallocation of resources. Up to this point in time, we can attribute most of the improved function of NICU survivors to improvements in Perinatal and NICU care. In the hemiplegia and diplegia categories, severity is definitely down and all but 1 to 2% of children with diplegia are also now expected to walk and score on the GMFCS at levels I to III. The question now before us is should we rest on our laurels or go for gold? I think parents should be given information about their child’s areas of brain damage as early as possible. Good function needs consistent control of lower limb tone during growth. Children grow to half their adult height in the first 2 to 4 years of life. It seems silly to me to hold off on tone controlling treatments and technologies until the child has finished their first major growth spurt. Every parent of a child with preterm pattern diplegia knows that when the child moves, the legs stiffen, the heels move up and the toes point downwards. This tone, initially “activity dependent”, becomes stronger and stronger and more persistent with each growth spurt. This is the conundrum: cerebral palsy is caused by a non-progressive brain lesion, but the spasticity associated with this brain lesion is progressive with growth. Fortunately, there are many methods available to manage tone and prevent body distortion, starting with infant massage and stretching to a normal range of motion. Bracing is always needed and there are improved methods now available. Spasticity management has also improved with Botulinum Injections and Selective Dorsal Rhizotomy in the more severe cases. The problem is that the available adjuncts to routinely prescribed physical therapy are rarely used early or continuously until growth is completed in the late teen years. There seems to be a systematic problem in the allocation of resources. Children with preterm pattern cerebral palsy, both hemiplegia and diplegia, are at the milder end of the severity spectrum. All but 1 to 2% of the children are GMFCS level I to III, which means they all walk. I have traveled the world teaching my approach to rehabilitation and unfortunately, there is a prevalent belief system that children who are mildly affected are “good enough”. In my view, this is wrongheaded thinking and not based on current neuroscience knowledge. It is time for all of us who are involved in the care or upbringing of these children to demand both better services now and on-going research to determine the best ways to achieve significant improvement. Next week, I will start to tackle quadriplegia, the form of cerebral palsy with all four limbs involved. As ever, I look forward to your questions and comments. Sophie has spastic diplegia was born premature at 30 weeks. She is now 2.5 and getting closer and closer to walking independently with an abnormal gait. I started looking into SDR and am not sure she would need that extensive of a surgery. We have had Botox twice now in her lower extremities and though it has worked well, I wonder if she will need more extensive spasticity management. I have read your SDR write-ups but was wondering if you think this should be done at an age of 2-3 or if utilizing other therapies to try to take advantage of neuroplasticity at this age with current spasticity levels would be a better option? Thank you for your comment Shannon. I think I would get an SDR evaluation and ask the question to them as well as the physician(s) managing her Botox program. To me, the question is whether or not the tone in her legs can be effectively managed with her current program. To me, there is little value learning to walk abnormally, creating bad habits that are harder to change later. The clinical sign that I value the most is how “fixed” is her tone. If she is always tight, then more invasive interventions may be needed. If the tone is more variable, then the combination of heat, massage, daily stretching, trunk support, the correct AFOs and Botox can allow improved gait to develop. The deep water jogging program also strengthens and teaches a better reciprocal movement pattern. Print out some of my posts and discuss the issues with your team. Thank you, Karen, for this wonderful post! We started managing tone at 18 months with meds and at 2.5 are now going for Botox. So many great points you bring up. Very much appreciate the continued conversation. Love this and will be reading more! I would love to chat or email with you some time to help change the way we approach CP. I am DPT with a daughter with spastic diplegia CP. It was like pulling teeth to get doctors to listen to my needs, concerns and recommendations for my daughter. Thank you Aspen, It is amazing to me that even when parents are trained therapists or physicians, their input is still too often ignored or diminished.If we all start talking from a base of knowledge, things will have to change.The reason I would like everyone to read all the posts as it is so important to know what your child’s risks and problems are and what they are not! Parents are free to download and print any of the posts to share with your healthcare team. Thank you for writing this blog. My 3 year old son has spastic diplegia CP and I’ve asked his healthcare team what their recommendations are and why and no one can give me reasons for Botox or other treatments in a confident manner. I felt like there was more to all of this and I needed someone to confidently guide me with facts and proven results. I’m not the smartest person on the planet but I’m not a moron either and it’s challenging enough to be a parent with a special needs child, let alone treated like I won’t understand if a doctor tried to explain what when and why we should pursue a course of treatment. So thank you for breaking it all down in your various posts. Thank you! And I look forward to your book release! Thank you for your kind comments.There is a wide range of communication skills in the general population of doctors. They are subject to human foibles as we all are. The Book How Doctors Think by Jerome Groopman is very helpful and I highly recommend it. Do you have any information about how these treatments work for children with Kernicterus? My son is 1 but cannot crawl or walk. Also I have anecdotally heard of children using cannibis oil, but our neurologist says this is too unproven and will be prescribing us baclofen. Thank you for your email.I think there is some evidence…clinical…that cannibis oil may be helpful in some children with intractable seizure disorders, but kernicterus is quite different.In my experience, baclofen is a good drug to trial. Unfortunately, controlling the involuntary movements often requires some trials to get the best results. Compression garments may be helpful at some point. This blog may be of interest. Unfortunately, the TES unit is no longer available. My daughter is 18 months with spastic hemiplegia affecting mostly her right leg (arm and hand is almost unaffected). Strangely she was born on term (suffered severe brain damage during birth but is now mild) so I guess her pattern is an exception. The tone in her right leg is preventing her from walking independently right now and I am wondering how best to help her. I would like your opinion on two matters: 1) I have read that Botox has temporary effects on tone that wear off after 3 to 6 months. Do you think that in a young child the Botox could actually help reducing the tone permanently by allowing neuroplasticity/ the development of correct movement patterns to take place? Is 18 months too young for this? 2) If you are familiar with the Anat Baniel Method, you have perhaps read their position on AFOs: that by maintaining the ankle in a fixed position, AFOs prevent the body from figuring out how to move it in relation to other parts of the body and to make new neural connections accordingly. How do you reconcile the need for the child to make new connections/ be aware of how to move her ankle and the need to prevent the formation of bad habits? Also, I am not sure how AFOs would apply to my daughter as she is always going back and forth between standing/cruising and getting back to sitting and crawling, so I feel AFOs would restrict her movements on the floor and not be practical. Thank you very much for your input on this! Joelle,I responded to your Botox question and the positive indications for AFOs in a previous post. If you read my book you will learn that in over 40 years of work with infants and toddlers with CP, I have NEVER found a single method that is a clear winner. What you do to give the child the best possible outcome varies with the degree of damage, the stage of recovery and the brain development. The family wishes and the child’s reaction to treatment are also important variables. Treatment is not “one size fits all” event. Alignment, allowing the body to grow in the right way, is a crucial point.It cannot be ignored as it only gets worse with growth.If your daughter’s tone increases as she comes up to standing or crawls, then she is wiring in the maladaptive habits of CP With each repetition.Hope this helps.